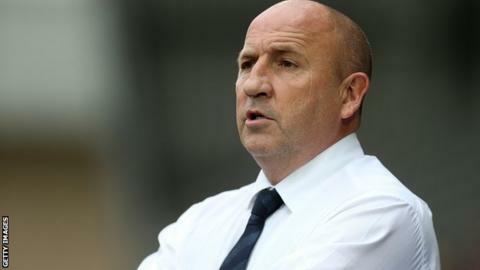 Accrington Stanley manager John Coleman has praised the way his players have bought into his philosophy after his return to the club as manager. Stanley won an incredible game 5-4 at Northampton as Coleman started his second spell with three points. They have now won three of the last four matches in League Two. "We went out to play a certain style of football and that's the style of football we're going to play under me," Coleman told BBC Radio Lancashire. "It's the style of football we were playing when I left and players enjoy playing and will buy into it. "It was like never being away. We never did things easy last time around and it's certainly the case now." The 51-year-old, who has had spells in charge at Rochdale, Southport and Sligo Rovers since his first stint at the club, took over after James Beattie ended his 16-month spell in charge. Coleman previously led Stanley from the Northern Premier League First Division into the Football League, and is now hoping to install more belief into his squad. "If you get something you've worked for it tastes a lot better than if it was given to you, I certainly think those three points were very well earned," added Coleman, who brought in his long-time assistant boss Jimmy Bell as part of his backroom staff. "People will say about myself and Jimmy coming back, but forget that - this win was down to the players. "We should be tired of being little Accrington, who are always punching above their weight to stay in the Football League: we're here on merit. "We've got fantastic players and good people, they are good lads as well and they're as good as anybody in the league."